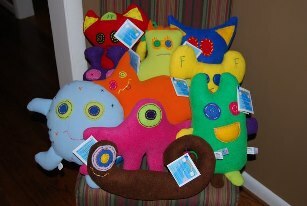 Constructed from polyester fleece, these one of a kind, hand crafted friendz are unique and cuddly! They are hand embroidered, and great care taken in the details! Super quality products. A child can design their own, using their own sketch or the template provided. Not feeling overly creative? They also have some predesigned characters you can add to your collection of Friendz. This would make such a great Christmas gift for a budding artist! A new product in the line up is the Tie Dye Freeky Friendz Tshirt! How fun are these! They do run a tad small so I am glad they ask for you to provide measurements rather than just a shirt size. This way it will ensure the shirt fits wonderfully, especially since they will never want to take it off again! We love tie dye shirts around here and have fun making them each year. The Freeky Friendz character on the front adds so much to the already gorgeous shirt! We are going to run 2 rafflecopters for this giveaway. Enter just 1 or both if you like! The first one is for a plush Freeky Friendz premade. The second is for a Tie Dye T-shirt. I like the purple cool cat. I would choose the pinks or circles for the shirt! I would choose swirls or blues. THe pillow dog or the sharksy! The swirl or scrunch tshirts are cute, in anything boyish! I like the Burley Squirrelly. I like the swirl style t-shirt best! pillow dog and a boys design for my grandson...blues, greens whatever goes well with the applique. I would choose a shirt in multi colors and radiating lines. My daughter is obsessed with monsters lately so I would get her the Mr. Monster.